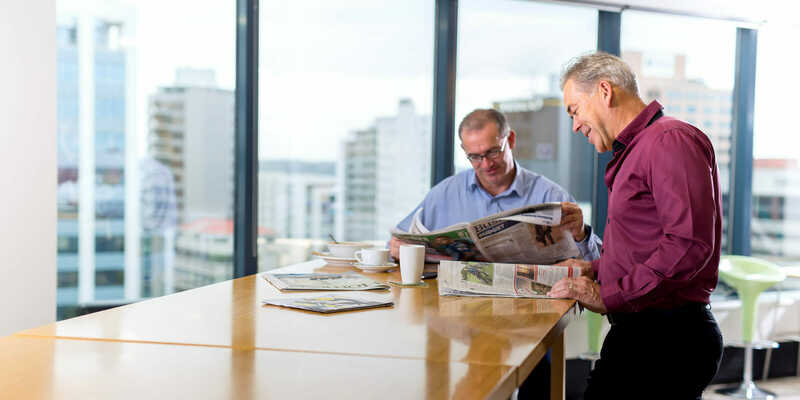 The landmark Vero Centre in Auckland’s Shortland Street has just received an extensive upgrade to its main entrance lobby, with owner Kiwi Property delivering an innovative design response to increased tenant demand for break-out meeting spaces. Built in 2000, the Vero Centre remains one of Auckland’s most prestigious office buildings, attracting and retaining some of the country’s most respected companies as tenants, including Deutsche Craigs, Russell McVeagh, Vero Insurance, Bell Gully, Asteron Life, NIB and Goldman Sachs. In order to optimise space in the tower lobby for tenant convenience, Kiwi Property has completed a $1.7 million upgrade that has created a number of precincts to address a variety of meeting styles. ‘For instance a ‘high energy zone’ has been created with high level benches and seating to support team meetings. Conversely, private single-seat, acoustically-protected areas have been created for those occupants seeking some individual time out to work an issue through,’ Mr Johnson said. ‘Efficiency can sometimes be difficult during a meeting over coffee, while one team member removes themselves from a meeting to place an order. We’ve met this challenge head on and provided ‘sit-to-order’ areas where a maître d’ will take coffee orders’, he said. Other lounge areas have been established where building occupants can self-curate the seating arrangements to suit their meeting. As part of the upgrade, the popular Pavilion restaurant has been extensively remodelled and opened up to be intimately linked with the main lobby rather than as a separate space, as it was previously. The outdoor plaza areas have also been substantially renovated with new landscaping and seating. Glass meeting pods have been constructed in the outdoor area to provide a unique external meeting space where people can enjoy a fresh air meeting whilst being protected from the elements. A dedicated coffee kiosk has been established for those seeking a ‘grab and go’ coffee with a light snack. To adapt to the evolving commuting habits of the Vero Centre’s 2,000 occupants, Kiwi Property is also constructing state-of-the-art end-of-trip facilities. The facilities will include bike racks, showers, lockers and drying amenities. ‘This will be a standout addition for our tenants. Our amenities will include hair dryers, ironing boards and a free towel service, as well as televisions linked to news channels to keep users abreast of the day’s developments,’ said Mr Johnson. The bike racks will include a workstation, air pump and tools so cyclists can tune their bike for the ride home when needed. Kiwi Property, who worked with New Zealand design house Space Studio on the lobby renovations, has also recognised the rapidly growing popularity of electric bikes and will install electric bike charging stations alongside the bike racks.